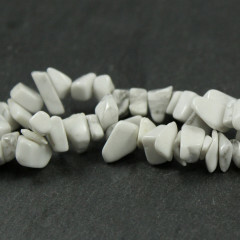 Howlite can be quite a nuisance of a stone – it is often dyed, giving it a passing resemblance to Turquoise, which is enough to confuse some newer rock and gemstone collectors. It is a white mineral, originally discovered in Canada – it was often found in a Gypsum mine, creating a problem for the miners. Naturally, the stone occurs in an almost cauliflower shaped crystalline structure, with veins of grey or black running through it. It is not typically used for jewellery as it is, although it is sometimes tumble polished or carved, for its supposed healing powers. 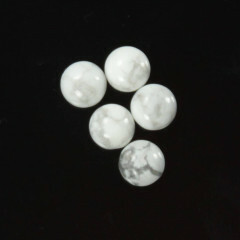 The most important thing about this stone is its use in the creation of fake stones, usually Turquoise. It accepts dye quite readily, and the veins give it an appearance similar to Turquoise, enough to fool newer rock and gemstone collectors. 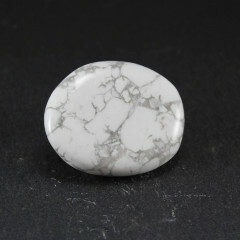 One easy way to identify a piece is a destructive test – either perform a streak test, or break the stone in half – it is unlikely the dye will reach the centre of the stone. 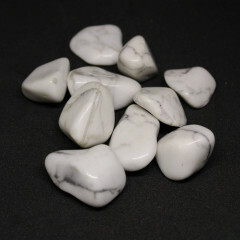 The stone is thought to offer numerous benefits, including relieving stress and helping with mental stability. 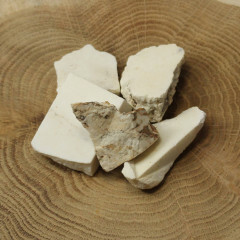 It is also meant to strengthen bones and teeth – likely a reference to its calcium structure.